In 1971-72, hockey was red-hot in Boston, where Bobby Orr and the Bruins dominated the NHL. Hockey was so popular, the Bruins purchased an AHL expansion franchise to play at Boston Garden. The new team was called the Braves, and were, naturally, the top affiliate of the Bruins. The team was coached by Bep Guidolin, a former NHL forward who would go on to coach the Bruins a year later. 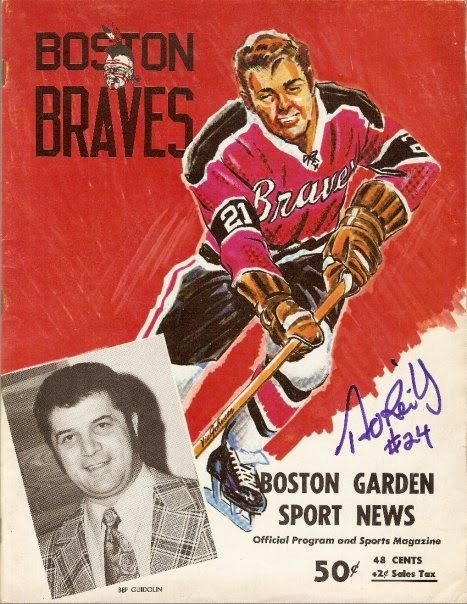 The Braves would have their best season, on and off the ice, in 1971-72. Off the ice, the Braves were a smash success, averaging 11,208 per game, easily the highest in the league. The Braves finished in second place in the East Division, with a sparkling 41-21-14 record, just behind league best Nova Scotia. Guidolin's Braves had the fifth-best offense in the AHL, scoring 260 goals. They were led by former NHL winger Doug Roberts, who scored 35 goals and 75 points. Garry Peters led the team in goals with 39, and Don Tannahill was the other 30 goal scorer. Two other players had at least 20 goals. Boston topped the AHL in defense, allowing only 191 goals. Both Braves goaltenders would eventually make it to the NHL. Starting goalie Dan Bouchard had an excellent 2.51 GAA in 50 games with four shutouts. Bouchard would later play in the NHL with Atlanta/Calgary, Quebec and Winnipeg. Backup Ross Brooks played in 30 games, with a 2.38 GAA and one shutout. Brooks would spend part of the next four seasons with the Bruins. The Braves would face the Providence Reds in Round One of the Calder Cup Playoffs. Boston would zip by Providence in five games (best of seven), outscoring the Reds 20-14. However, they would run into a red-hot Nova Scotia Voyageurs squad. The Vees hammered the Braves in five games, allowing only five goals in the series. They would go on to win the Calder Cup in five games over Baltimore. Took forever to find a Boston Braves program, and it wasn't too cheap. It's a nice program though, at 36 black-and-white pages. Lots of articles about Braves players and personnel. Local ads include Bobby Orr, Inc., Rockingham Raceway (harness races) and Bob Lee's Islander Restaurant. The colorful cover is autographed by Terry O'Reilly, in his rookie pro season that year. O'Reilly, "The Tasmanian Devil", would go on to a long career as a Bruins power forward, piling up goals and penalty minutes. That night's opponent was the Rochester Americans, featuring 37-year old veteran defenseman Don Cherry (ever hear of him?). Aftermath: Braves attendance would drop like a lead balloon after their inaugural season, bottoming out to a measly 1,328 per game in 1973-74. Most of the blame went to increased competition in the Boston area, as the New England Whalers of the WHA began play in the 1972-73 season. NHL expansion also hurt the Braves, as the team lost, among others, goaltender Dan Bouchard. After suspending operations, the Bruins maintained the franchise rights of the Braves, paying a small fee to the AHL to keep the team mothballed. The franchise rights were eventually sold to the Winnipeg Jets, who transferred the team to Moncton, New Brunswick, calling them the Moncton Hawks.